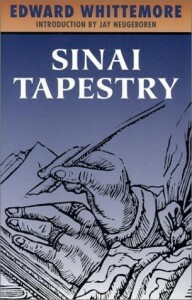 Sinai Tapestry, Edward Whittemore, Old Earth Books, 2002 (c1977), ISBN 9781882968220, 333pp. I managed to find the first volume of Whittemore’s “Jerusalem Quartet” at our local public library. 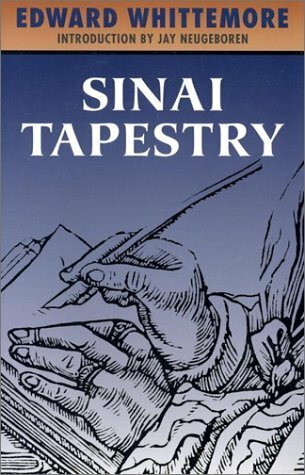 True to form, it has the same weird touch that characterized his first novel (Quin’s Shanghai Circus), but lingers more on each of its characters. Whittemore is writing for the long haul, and what may look like a singular book on the surface is obviously only part of the whole. This, I think, is my problem with it. I was so amazed by Quin’s Shanghai Circus, that I expected more of the same here. The ingredients are the same; the cake tastes different. This volume introduces the characters, including: Skanderberg Wallenstein, who discovers the original Bible and a disturbing secret about it, and so decides to write his own; Haj Harun, antiquities dealer who has been alive for over three-thousand years, and sometimes having trouble keeping his centuries straight; O’Sullivan Beare, the umptiumpth son of a poor Irish fisherman, caught up in another war in the Middle East; and Stern, son of Strongbow, who feels it is his destiny to try to build a new world in a land that fiercely resists anything but tradition. Whittemore’s trademark method of interweaving the background of his characters while continuing an overall plot puts all these characters in touch with each other, sometimes working together, sometimes at ends. The details and some sections here are as good as anything I’ve ever read, but the novel didn’t congeal for me, and I was disappointed. Maybe I had expected too much. I’ll still finish off the series, as I find the books, but unless the succeeding books somehow cast new light on the first volume, this one was a wash for me.